Near the end of our trip to Los Angeles last month, while driving down the Pacific Coast Highway to visit Janet for tea, we stopped for brunch at the Starling Diner. Located on East Third Street in Long Beach, the look and feel of the Starling Diner is that of an old-time neighborhood institution. The food is comforting, the service friendly, and the fellow diners are, well, neighborly. In times past, neighborhoods were Communities where everyone casually knew each other and the gathering places were icons such as the front porch, the corner store and the neighborhood diner. It has always been our personal mission to create gathering spots that provide a sense of place along side the highest quality food and drinks. We live in and love Long Beach. We just made a place where we would like to meet our friends and connect. My cousins had first brought me here in 2009 and I was eager to share the cute restaurant and tasty dining experience with Tawn. He wasn’t disappointed. 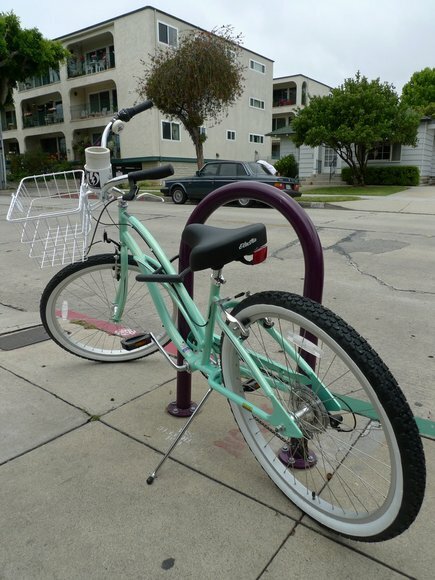 This pale green cruiser parked outside seems to exemplify the Starling Diner. Located amidst houses on a quiet street, this is the type of place you would hop on your bicycle and ride three blocks to meet some friends for breakfast at. 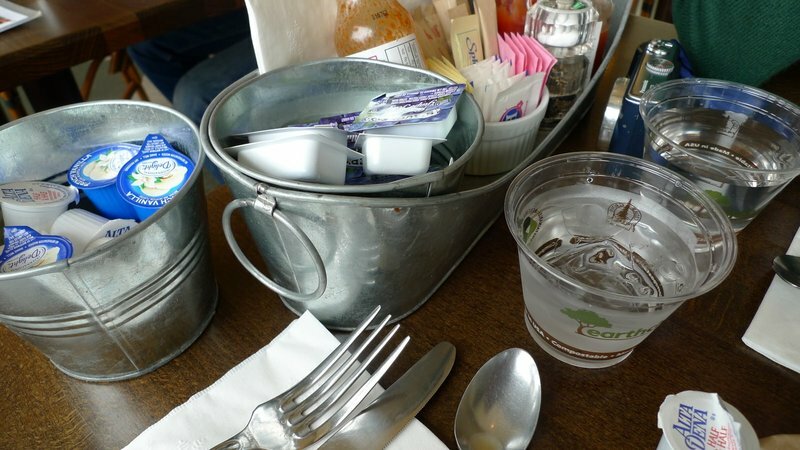 The tables are crowded with little tin tubs of all the condiments you might need. Interestingly, they serve water in these biodegradable corn-based plastic cups in order to save the environment. As I pointed out to the server (in a friendly, non-complaining sort of way), they would do more to save the environment to serve their cream, jellies, sugars, etc. in bulk containers rather than individual sachets and packages. The fact that our server took that suggestion with a thoughtful smile and remained friendly and welcoming is a good example of the type of consistent service I’ve enjoyed during both my visits. 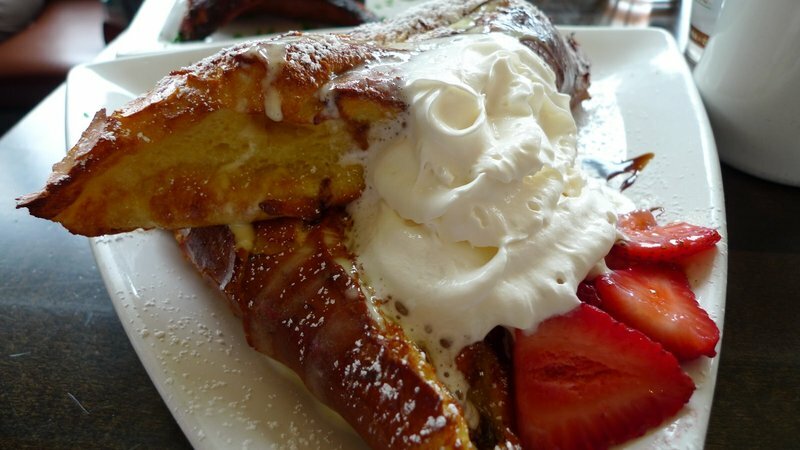 The highlight of the menu is the San Francisco stuffed French toast. Unlike most French toast, this is broiled not fried, and is made from baguette, not square loaf bread. It does not disappoint! The result is something that is light and crispy rather than heavy and soggy like most French toast. This is a recipe I would like to learn to recreate at home. 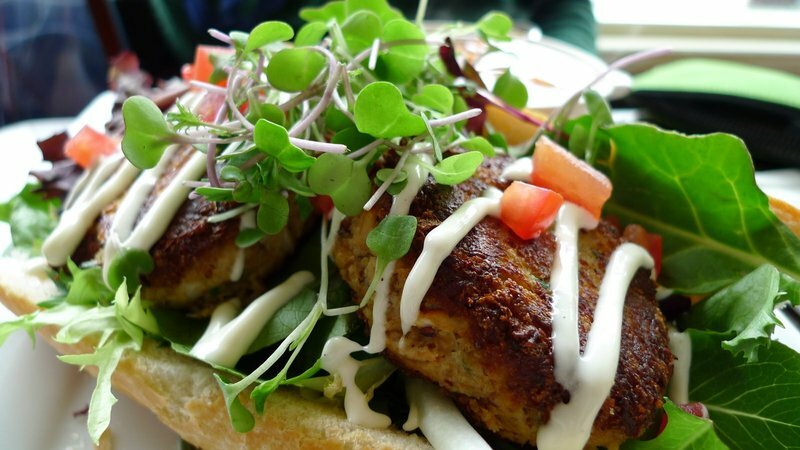 Tawn had the crab cakes sandwich, which had these wonderful, large lump crab meat and tons of fresh greens. This was really tasty, too. All in all, the only disappointment at the Starling Diner was that there were just the two of us and, as such, we were only able to try two items on the menu. Mark this on the list of places to come back to on a future visit! This entry was posted in Uncategorized and tagged Beach, breakfast, Broiled, Brunch, California, Diner, Dining, Eating, food, French, Long, Long Beach, Los Angeles, Restaurant, Starling, Toast by christao408. Bookmark the permalink. Oh, my goodness, it looks wonderful! Wonder why I’ve never heard of it — maybe because it’s so neighborly?! Chris — this looks like a place in roughly the same neighborhood that Cher used to own — a very residential neighborhood, with just a few businesses tucked in. Cher’s place was wonderful — I wonder if it is still there, or if this might even be the same place with a new owner ~ ~ ~ That area would support some very nice little places! The french toast looks very big and delicious! I should check this place out when I’m in Long Beach. I’m with Tawn on this one. I’d definitely order the crab cake sandwich. In fact, I’m dying for it right now. It looks to have everything going for it. Crispy crust and probably creamy center with maybe a bit of crunch from onion and pepper inside, with the unbelievably fresh looking greens; on top and underneath. I’d hope for some thinly sliced red onion mixed in with the greens too. What was the white sauce? I like the “light and crispy” idea of the french toast, but French Toast always ends up being too sweet for me. How sweet was it? Oh, you’ve made me so hungry and I can’t eat anything because nothing will be as satisfying as eating that sandwich right now! I must remember this place formy next visit. French toast is calling my name. Great pic of you also. A great post. I want that French toast in me! That is NOT diner food! 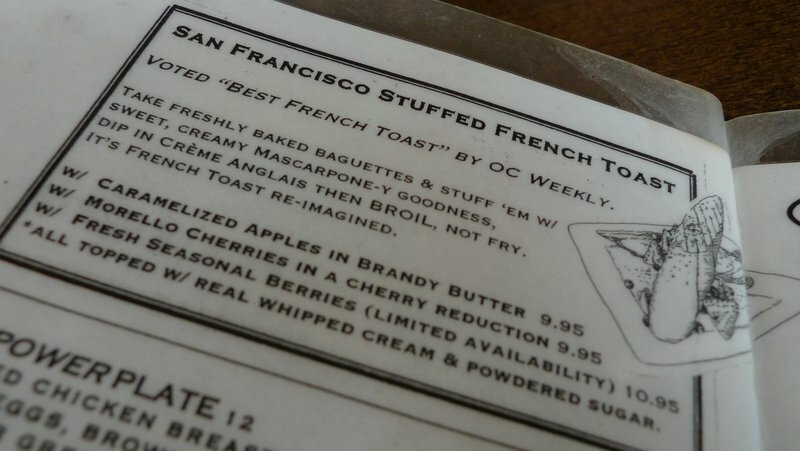 If the diners around here had a menu like that, I’d want to eat there too… Love the look of the French toast. I’ll have to imagine the taste! You and Tawn seem to have the same taste in food that I do! I love the French Toast as it is called and found a place down here that serves it. And seafood – anytime for me! Yeah the two dishes to share between two thing when you visit a place once in a great while is getting to me. Do you have the recipe for the french toast or do you want me to give it to you? It is sinful and Gawd so decadent to my morale. I sit with my tongue hanging out. 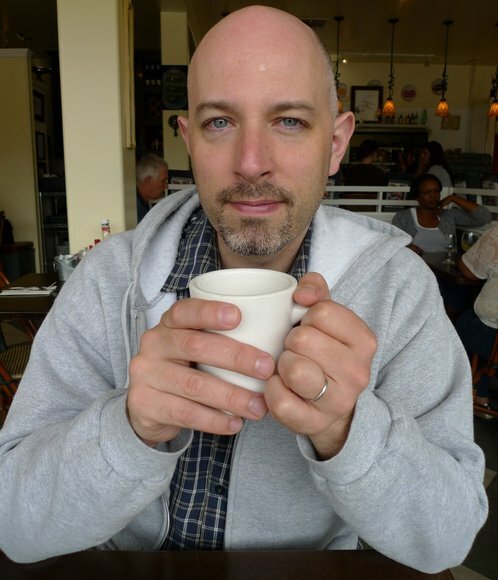 @Inciteful – @awoolham – Thank you and thank you for the recommenation. @ZSA_MD – Do you have that recipe? If so, kindly send it my way. I’ve been trying to figure out how to do it but haven’t experimented yet. @yang1815 – Like going to dim sum, you really need more than two people to enjoy the range of dishes. @Fatcat723 – If by “the same taste” you mean “food that is good”, they you are absolutely right @The_Eyes_Of_A_Painter – My pleasure. Glad you enjoyed. @murisopsis – The funny thing is, I was calling it the Starling Cafe and even started to write the post as such, until I looked it up online and discovered that it is in fact called the Starling Diner. Who knew? The fare certainly doesn’t seem diner-like, but it sure is tasty! @Roadlesstaken – Seriously. @Jewelbeetle – Regarding the salad, I think the sauce was some sort of a mayo. As for the French Toast, it wasn’t sickeningly sweet but with the fresh strawberries there was no need to add syrup. @CurryPuffy – Would be worth a trip, especially if you combine it with a visit to some of the other sites in the Long Beach area. @slmret – Hmmm… don’t know if it has any relationship with Cher. The owner is a lady who used to own a cafe in San Francisco some years back but maybe Cher is a partner in this venture? @secade – Well, you can rarely take too many pictures! Oh cool – love the last comment! That French toast does look decadent. I think one of the reasons why some restaurants don’t serve jams, sugars in containers is for sanitary reasons. I’ve seen some nasty stuff done to them. i’m not a huge fan of french toast, but that actually sounds good. however, you’ve got to come to maryland for good crab cakes! @Joan Samson Hodson@facebook – Oh, thanks, Joan. We really enjoyed dining there and hope to be back in Long Beach sometime soon for another meal. @ElusiveWords – The idea for serving items in common containers is something I saw done several years ago at the Fairmont Hotels up in Canada for environmental reasons. Not sure if it ends up creating more or less waste, though. @kunhuo42 – I know, Aaron. The best crab cakes I’ve ever had were in Baltimore. One of these years Tawn and I were go there, visit you, and try some crab cakes.